“They were treating him differently today. Not like the child star that his mom had talked about the night before. 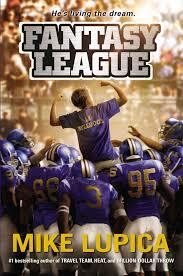 Just a star.’’ Charlie Gaines is the king of the professional football fantasy league at the age of twelve. When a sports radio host plays Charlie’s fantasy picks on air, and all of Los Angeles discovers that he is “one of the best,” Charlie soon becomes a celebrity, but maybe not the way he expected. Mike Lupica’s Fantasy League will easily keep the reader engrossed in the story, and on the edge of his or her seat waiting to turn to the next page. The smell of the newly cut grass on the football field provides a setting that is calm and clear. Also, when Charlie’s mom is talking to him while eating dinner, the reader can easily picture the table, food, and conversation. Even when Joe Warren, the owner of the L.A Bulldogs, is talking to Charlie about his fantasy picks, the reader can see the look of rapture in Charlie’s eyes when Mr. Warren thinks that his fantasy pick, Tom Pinkett, is a great idea and later drafts him onto the team. Furthermore, Charlie even became close friends with the owner of the L.A Bulldogs, Joe Warren. In spite of his success, Charlie later becomes too absorbed in his fame, and decides to tell Joe Warren about his next fantasy pick. However, he did this without consulting with his best friend first, causing problems between him and Anna. Charlie wonders if things will ever be the same between the two friends again. Fantasy League has many twists and turns, but eventually finds its’ way back on track and is wrapped up with a great ending. I can compare Fantasy League to many other books, including Out of My Mind, by Sharon Draper. In both Out of My Mind and Fantasy League, authors created a tragedy and many things go wrong, but in the end, characters overcome it in a very powerful way, creating an interesting image for the reader.